Beginning 150 years ago, hundreds of thousands of cattle made the dangerous trek from ranches around Fort Worth, Texas, up to Abilene, Kansas. During the 1860s through 1880s, the Chisholm Trail was an expressway funneling livestock north to market, with cattle only moving 10 to 12 miles per day. The trail was named for Jesse Chisholm, a man who ironically was never part of the great cattle drives; he instead was a trader and interpreter. Chisholm may not have used the trail for cattle, but he helped create relationships between tribes and settlers along the trail, which in turn created a pathway to build towns in Texas, Oklahoma and Kansas after the Civil War. 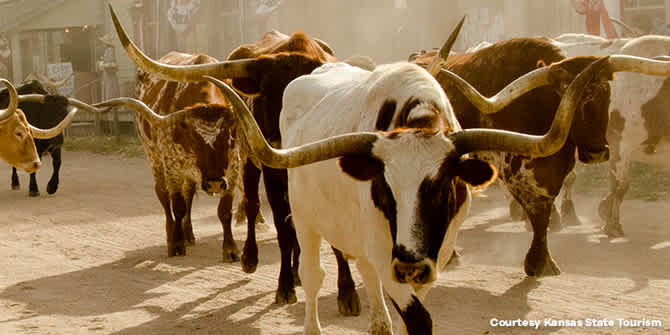 During the commemoration of the 150th anniversary of the Chisholm Trail, drovers will move a herd of Texas Longhorn cattle from Pond Creek, Oklahoma, to Wichita. The nearly two-week voyage will closely resemble the same trek made by so many along the original Chisholm Trail. Visitors will be able to participate in Cow Camp, happening about 3-6 p.m. daily at many stops along the way. The public will be able to see drovers in authentic cowboy wear, horses, nearly 100 head of cattle and cowboy campfire cooking demonstrations. All of the drovers are volunteers, so be sure to head out to one of the stops along the trail to thank them for being part of this movement. You can view the schedule here. If you can’t make it out to one of the trail stops, you can certainly follow the exciting experience on social media. Be sure to like the Chisholm Trail 150th Celebrations Facebook page for updates. You can also follow the Visit Wichita Twitter page (@VisitWichita). Trail Boss - Takes control of the whole show, making sure everyone is doing their job and tending to any issues that arise. Trail bosses choose the route and keep track of the cattle and drovers. Swing Riders – These riders create the boundaries for the herd, making sure they remain together. If any cow tries to stray, they drive them back into the group. Flank Riders – Similar to Swing Riders, these cowboys hang out toward the back of the herd on each side to keep the cattle together. They make sure none of the herd becomes too spread out. Drag Rider – This cowboy brings up the tail end of the group, pushing the slower cattle to keep up with the rest of the herd. Their job is to drive the group and other riders forward at a steady pace. Chuck Wagons/Cooks – This job is one of the more important ones along the trail. Cooks are up early before everyone else making sure meals are ready for both drovers and cattle and they don’t get to sleep until everyone has eaten. No matter what the weather is, these members of the cattle drive are responsible to making sure everyone is fed and in good spirits. They also are responsible for chuck wagons and all the food inside. Supply Wagons – These wagons are where extra supplies are stored along the trail, including horse feed, cattle feed, extra goods and some precious cargo. Click here to read more about how you can witness this re-enactment. Wichita offers many ways to commemorate the Chisholm Trail and its historical significance in the development of our great city. At any given time year-round, you have the chance to learn about the Wild West at Old Cowtown Museum. This living history museum lets you immerse yourself in the sights, sounds and activities common to a Midwestern cattle town. From watching a blacksmith at work to enjoying an ice-cold sarsaparilla, take a trip back in time and party like it’s 1865. You can find more events celebrating the 150th anniversary of the Chisholm Trail here.